The majority of would-be ethical investors are deterred by a lack of choice offered by traditional financial institutions, or industry jargon. Online platforms, built on ease of use and transparency – such as Energise Africa, established in early 2017 – have thus spotted an opportunity. “People have become more discerning, and after the financial crisis there’s mistrust of the financial service industry,” says Lisa Ashford, chief executive of the UK-based not-for-profit investment platform Ethex. It teamed up with Lendahand, the fastest-growing crowdfunding website in the Netherlands, for the pioneering joint venture. “Increasingly, we want to know what our money is doing and where it’s going,” says Ashford. “Our research shows 19.5 million people in the UK want to create a positive impact on the world. The challenge is that a lot of people don’t know how to do it, or where to go to find more information. This is where new platforms, such as Energise Africa (developed by Lendahand and Ethex), are offering an alternative, with a range of transparent and straightforward investments in a wide variety of positive-impact businesses. They raise funds to lend to businesses that operate in different countries in sub-Saharan Africa. Investors can participate by investing in companies through bonds offered by Energise Africa. All Energise Africa projects have been launched to address the problem of energy access for low-income families in sub-Saharan Africa and the minimum investment is just £50, making it widely accessible. 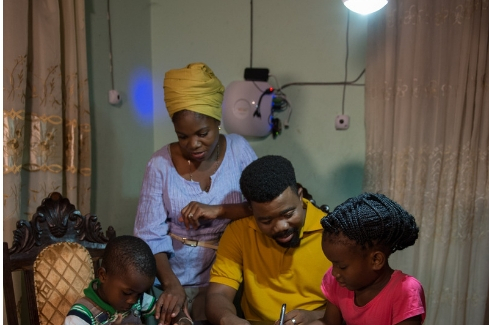 “At Energise Africa we’re demonstrating that people can invest in sustainable solar companies from as little as £50, providing these businesses with the low-cost finance to purchase and install the solar home systems, and enabling African families to pay back the cost of the system via affordable monthly payment plans,” says Ashford. “The beauty of Energise Africa is its simplicity. Anyone can come to our crowdfunding platform, click on a project, read all the information about it, and the benefits. It’s presented in a clear way using layman’s terms,” she says. Go to Energise Africa’s website, lendahand.co.uk, and read about the solar businesses working with them. These businesses sell small solar systems to families throughout sub-Saharan Africa. You will need to consider the return you are expected to receive (usually between 4 and 6%), the time taken for your money to be repaid, and the risk of investing in each solar business. You can invest as little as £50, and add more to your investment at any time. For some projects, UK aid and Virgin Unite will match your investment, helping to amplify its impact. Once the project is fully funded, the money is transferred to the solar business on the first day of the following month; interest starts building from this date. “If you are interested in a project, you lend your money – usually between 24 and 36 months – and it goes towards creating opportunities for families in need by expanding a pay-as-you-go solar scheme in sub-Saharan Africa,” explains Ashford, who has already invested in seven of the projects. The business you back uses your investment to purchase solar home systems and then proceeds to sell these systems to African families, with a financing plan. After 12 to 24 months, the family usually owns the system outright. “Energise Africa is a great way to help low-income households in Africa gain access to basic electricity services,” says Simon Collings, one of 45 investors who backed the first venture: Ugandan company SolarNow helped install 500 solar home systems for £300 per local family, to be paid back to the solar company by the family in instalments over 24 months. “The platform is great at providing regular feedback to investors on what is being achieved,” continues the 62-year-old, who has since invested in four other projects. Every six months, you will receive both interest and a capital repayment from your chosen business. The solar business makes a repayment with interest. You can ask for these funds to be repaid to you, or you can reinvest them in a new project. Notably, all Energise Africa projects are Innovative Finance ISA-eligible, meaning eligible investors can invest in the solar businesses and benefit from potential tax-free returns, on investments of up to £20,000 per annum via an ISA wrapper. Match and first loss funding – offered on some projects, from UK aid, Virgin Unite, or Good Energies Foundation – can also help to mitigate risks of these investments.